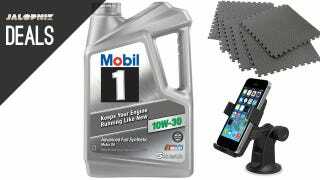 Mobil is offering up to $12 off five quarts of motor oil (or $15 off oil and a filter) via a mail-in rebate. Walmart seems to have the best online prices on eligible items right now, but you can basically buy the oil from anywhere. If you see a better deal, let us know. New: Refurb Sous Vide Supreme ($149) | Sous Vide Supreme | Multiple colors available. Limit 2. New: LG 65" 3D 4K LED TV ($2200) | Amazon | Previous low was $3300.